“Our daughter Beatrix was born a few days early and was 5lb 8oz. The midwives were very happy with her and we were sent home the same day. Being our first child we were very anxious and worried about all the normal things new parents do. I can remember when the midwife came to carry out her check on Beatrix and completed the heel prick test. 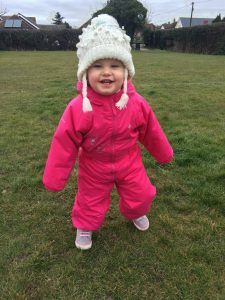 Bea didn’t seem too phased by it and the midwife explained to me that it was just a routine check and it is rare that anything arises from it. A few days later we had our final check up with the midwife and they signed us off and said that they were happy with all her developments and they no longer needed to see her. We were over the moon and decided to go off to a local shopping centre to buy some bits and have some lunch. Whilst out I didn’t even check my phone and it had been left on silent from the night before! We had a lovely day out and arrived home about 4.45pm. I can remember getting my phone out my bag and seeing loads of missed calls and messages from a London number, thinking it was someone to sell me something or tell me about PPI I wandered upstairs to run a bath and listen to the voicemails. I can still remember listening to the voicemail saying that it was a nurse calling from Great Ormond Street Hospital (GOSH) and they urgently needed to speak to us regarding Beatrix. There were about 3 messages saying they needed us to call back urgently and that we needed to go to GOSHl first thing in the morning. My heart felt crushed, I ran downstairs to get the home phone and tell my husband. 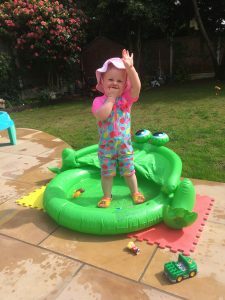 I called them straight back and they explained to me that one of Beatrix results had flagged up and they suspected that she had a metabolic disorder and they needed her to come in first thing to carry out some tests and to go through it all with us. I asked them what it was called that they suspected that she had and they said Glutaric Aciduria Type 1. I remember how much I was crying as I was writing it down. I couldn’t talk or ask any questions, I had to hand the phone to my husband. They told us it was best not to google it after we got of the phone to them but you can imagine that wasn’t going to happen! Googling it made me more scared, looking at our precious baby and thinking about what may happen and how our lives would be so different now. I don’t think anyone got any sleep that night and I kept hoping that they had it wrong, that we would go in the morning and they would say it wasn’t her sample or something had been missed. But they didn’t. They went through with us what it meant and what we needed to do. I can remember them telling me that if she isn’t acting herself or seems out of character she needed to go A&E and I can remember thinking “she is ten days old how will I know?” but I guess you do know. We spent that week waiting for the final confirmation call that she did have GA1 and they confirmed it on the Thursday. We went back on Friday and went through everything in a lot more detail. I think I cried every 10 minutes. We were given her medicines and formula and explained how much formula she needed to intake and that she would need to be fed little and often. At the beginning it was every 2 hours. We had an amount of protein she was allowed to have from Aptamil formula and how much of her Anamix formula she had to have. At first it was really hard because she wouldn’t drink one milk after the other. Once she had tasted one she wouldn’t want the other. So we decided to do one feed Anamix then two hours later her Aptamil milk. This worked for a little while but then she would want more Aptamil but wasn’t allowed and then wouldn’t want the Anamix after. We then decided to mix the milks (even though advised not to as they said she wouldn’t get used to the taste of them on their own), for us this worked much better. We would mix them together half and half and then work out what was left and divide it to ensure both targets were met. Some days she would be left with just Anamix to have over night and some days just Aptamil left to have over night, depending on her daily intake. It was very hard and tiring. We used to get through so many bottles and the washing and sterilising took ages! We had quite a few nights where Beatrix was so tired she didn’t want to wake every 2 hours for her feed and GOSH said that if she didn’t take her required amounts every two hours she would need to go to Hospital. We visited the Hospital a few times but it was just tiredness. 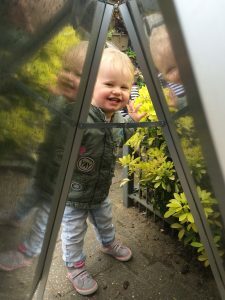 At 3-4 months we discussed it with our dietitian and they agreed if Beatrix upped her amounts she could go slightly longer periods to 3-4 hours! This felt amazing as we could actually get a 2 hour sleep between feeds! At 4 months old GOSH told us to start weaning Beatrix with her GA Gel. They explained that this would eventually replace her Anamix formula and contain all her Amino acids, vitamins and minerals. They explained that because the Gel has a very distinctive taste she needed to start it so she was used to it before any other tastes. She didn’t love it but she took to it OK most days. We would just do a spoonful here and there to get her used to it. They explained that she would eventually need this before each meal (before so that she was hungry and ate it first). The Gel is very important and she needs to have it. She is also on Carnitine twice a day. Beatrix also seems to suffer with Reflux and would be very gaggy on foods so she went onto reflux medicine which helps. Learning about protein allowance and monitoring everything Beatrix eats, weighing out all her foods and ensuring she has the correct amount of protein is tough and time consuming. We have learnt so much and her protein allowance has been the same for a while now so we are getting the hang of it all! We know the protein contents in most foods and our scales are our most used item! Beatrix has been taken to hospital a few times, mainly with tonsillitis! The first time when she was very small she was taken in for a few days and she was given a nose tube and a cannula to ensure she had enough sugar and food. She was well looked after and after a few days we were able to go home. However, that night she started to be sick and so we took her straight in and she had the cannula put back (this took a while as they had to find another vein). Then I became sick, then my husband and my mum. None of us where able to stay in the hospital with Bea (you can imagine how hard this was), thankfully my dad and my husband’s dad managed to avoid it and were able to look after her until we had been well for 48 hours! (That 48 hours felt like two weeks!) Again she was well looked after but it did take a good 4 days to get her back to eating bits and to bring her appetite back. Each time she has been in hospital it takes a while to get her appetite back and to get her to take her medicine and gel. Every time I get so scared that she won’t ever want it again but by a week she is almost back to her normal routine. I have to remember that when I get stressed and worried (it is so easy to say but you can’t help fretting when they won’t take their medicines or food). Usually if Beatrix is unwell it ends up in a hospital visit because she doesn’t want to take her ER drink every two hours when she has been unwell. I am hoping when she understands we can explain that she has to and this will help. Although when you are ill you usually just want to sleep and being woken up every two hours isn’t much fun for anyone! It has only been recently that we have been able to take Beatrix out when she is due her meals. Before she would be too distracted and not eat enough so we would have to go back home. This does still happen sometimes but we manage to take her out for meals now too and can go out for most the day without taking the whole kitchen! We do not take Beatrix to nursery but we do go to all the groups and she is around children a lot. 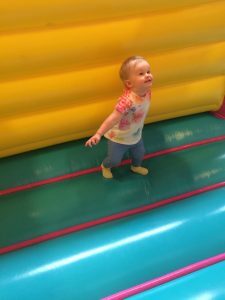 She really enjoys the groups and even though some parents keep their children away from these due to the risk of germs, we felt it was better for us to build up her immune system and ensure she has good social skills. She loves all her groups she goes to. It is hard to keep them completely away from germs as they are everywhere and we have been informed that it is much better for her immune system to let her pick some up. If you are affected by Glutaric Aciduria Type 1, or any other Inherited Metabolic Disorder and would like more information on the condition, advice and support, or to be connected with other families, please contact us.For more information about GA1 following a new diagnosis please click here.